Given that Collegetown’s been so active on the development front these past few weeks, I figured I’d run a couple of pieces related to its history and development. Here’s one of them. 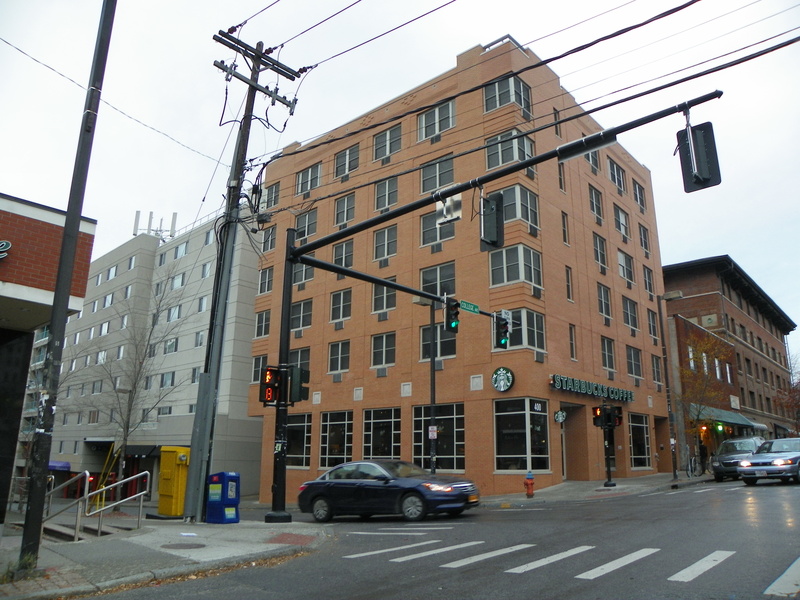 The building at 402 College Avenue (the “Starbucks Building”) isn’t very old. It was only completed in 2005. Prior to that, the site was home to a 3.5 story, wood-frame house dating from the late 1800s. I’ve had a heck of a time trying to find photos of it; it wasn’t an especially charming structure, the first floor had been built out for small storefronts (similar to the Kraftee’s Building), and the rest of it was pretty rundown. You can see clips of it in old file photos from the county tax assessment office, here and here. The two storefronts, mid-century bumpouts, housed a number of shops over the years – in the 1960s and 1970s, University Delicatessen (Uni Deli), then Gould’s Sporting Goods in the 1990s, and by the early 2000s, one (402) was vacant, and the other (404) was occupied by the Razzle Dazzle beauty shop. The house was owned by the Papayanakos family. In 2002, the only resident left in the home was Constance Papp (she opted to Americanize her surname), a retired Ithaca school teacher. She had lived in the building since 1958, or 44 years, and was 86 years old in 2002. Starting around 1996, the building was falling into serious disrepair, enough that the housing units were no longer up to code. But since Papp was the only resident, and made no attempt to rent the other three units, the building inspectors didn’t push the issue. Starting in 2000, Papp called the IPD on multiple occasions to report burglars. While none were found in any case, the police did report the serious housing code violations. Papp refused to let the building inspector in, and it took a neighbor and two IPD officers to help him execute the warrant. The interior was in shambles. There was water damage to her bedroom ceiling, the heating was busted, garbage strewn about in the living room, and pigeons had taken residence in the attic and third floor. It was a safety hazard, both to its resident, and to neighbor properties in the event of a fire. The other units were declared unsafe, and the old woman was given a reprieve once her unit was cleaned. But, showing signs of significant mental illness a year later, she was considered unfit to manage the property, and moved to an assisted-living facility west of Ithaca, where she passed away four years later. With no one to manage her affairs, a guardian was appointed, and it was decided to sell the building on her behalf, by way of a public auction of the parcel. Although it was in awful shape, it sits on the most trafficked corner in the city, making its potential tempting to many. Given its possibilities, the opening bid would be a cool $500,000. A lot of the big players in Collegetown real estate were there: Jason Fane, who I’ve tapped many keys about; Mack Travis (the retired president of what is now Travis Hyde); and Bill and George Avramis. 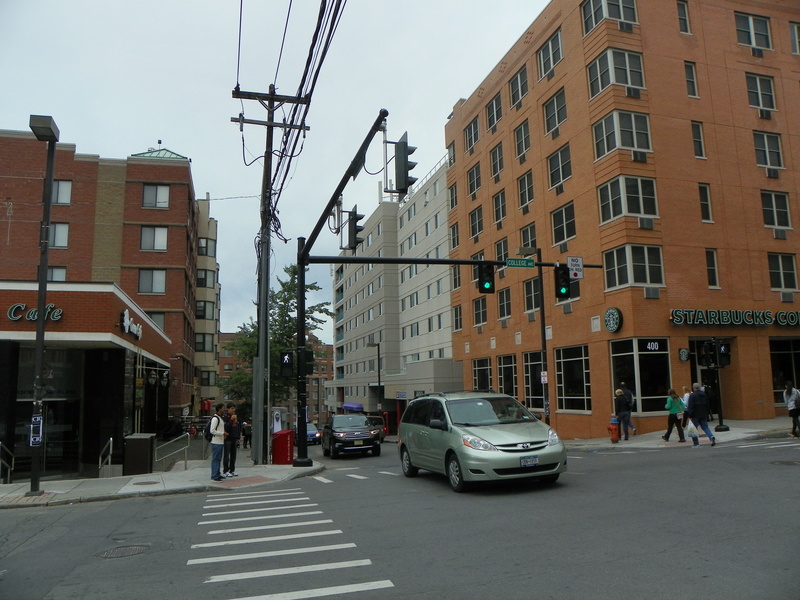 The Avramises are the third largest owners in Collegetown by property value, behind only John Novarr and Fane; given that Novarr’s rise is pretty recent, the Avramises were likely the second-largest back in 2002. Bill Avramis, the father, has been in the Collegetown market since the 1970s; his son George is a more recent addition. Elias Shokrian accepted the opening bid and initially seemed to have won by default with no word from the crowd until Philip Youen raised his hand. For several minutes, still, [auctioneer Christopher] Anagnost waited through long pauses to move from one bid to the next. All that changed when Jason Fane moved in, bidding 600,000 dollars. From there, Youen, Fane and Mack Travis quickly pushed the bidding up nearly 100,000 dollars. With a high and perhaps a closing bid in mind, Anagnost turned to Fane. He obliged with a 15,000-dollar advance and appearing satisfied, Anagnost prepared to end the auction with a call for final bids. He nearly declared the property sold before George Avramis entered the fray. Having already outlasted three prospective buyers, Fane wasted no time in advancing the bid further. Slowly and incrementally, Avramis and Fane bid each other to 800,000 and then 900,000 dollars. The crowd assembled in the courthouse — mostly spectators — was looking exclusively to Avramis and then back to Fane for each ensuing bid. Finally, with Avramis at 925,000 dollars, all eyes turned to Fane. “My congratulations to George,” Fane said, withdrawing abruptly from the auction. Fane had reached his limit and Avramis later conceded that he was approaching his as well. Immediately following the auction, Avramis said he would consider saving and restoring the building or tearing it down and paying a high price for the land. He said he would settle on specific plans for the property by the closing. Closing was 30 days after the auction (therefore, April 10, 2002). While the current site was underutilized, historically compromised and in poor shape, the biggest issue to rebuilding was parking – any new build would require a parking space for every two tenants, within 500 feet of the parcel. The Avramis family had been eying the parcel for a while, making offers to buy the house (and being refused) as far back as the late 1980s. Well, being the large landowners that they are, the Avramises found a loophole of sorts, which they used with the city’s benediction. It may have taken a year of back-and-forth, but the city agreed that George Avramis could supply parking at 211 Linden, a parking garage owned by his mother Maria. This allowed him to move forward with a 6-story, 20-unit, 35 bedroom building designed by Jagat Sharma. Given the recent zoning changes, I’m inclined to wonder if the Avramises have any plans for redevelopment of some of their other properties. Had it been another buyer, the results could have been very different. The house could still be there. It could be another Fane parcel. A few seconds of decision-making made all the difference. Funny how that works.